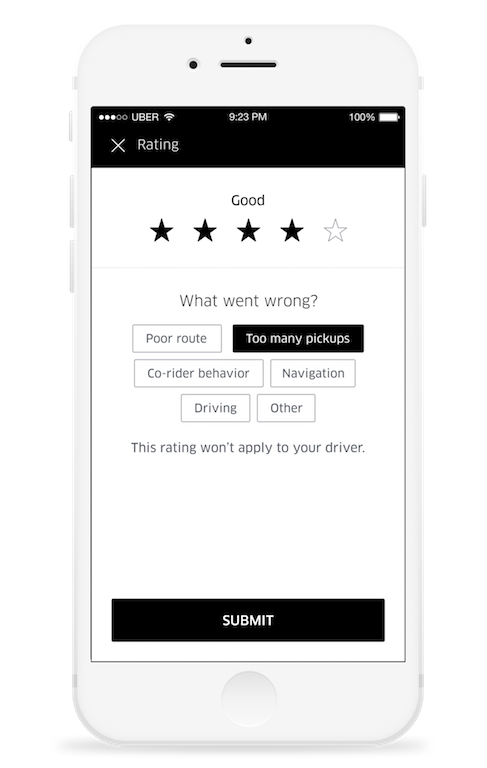 Ratings are a two-way street at Uber, and our 5-star rating system helps to create a positive experience for everyone. We’ve heard from our drivers, however, that we need to do more to make our rating system fairer. Using this feedback, we’ve made two updates to the rating system, both of which are rolling out globally starting today. With POOL trips, there are things outside a driver’s control that impact how riders rate the experience. For instance, was a rider unhappy with the match our algorithm made or was their co-rider too chatty? We believe that drivers’ ratings shouldn’t be affected by things outside their control, so we’re adjusting the POOL rating system to make it fairer for drivers. Now, when riders rate a POOL trip less than 5 stars, they can select additional reasons why. And when the reason is something like the route or co-rider behavior, we won’t count the rating toward the driver’s average. While this may seem like a small change, it will help us improve the driver experience as we continue to enhance the product. Drivers do their best to make Uber enjoyable and safe for their riders, and we expect that riders do the same for drivers. But many riders forget that their driver is also rating them, too, and things like eating in the car, slamming the door, or trying to pile in more people than seatbelts can impact whether it’s a 5-star experience for drivers. To give riders more visibility into how drivers are rating them, we’re making rider ratings much more accessible in the app. 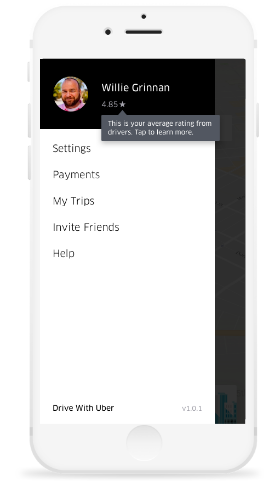 Now, a rider’s rating will be displayed right under their name in the app’s menu. We hope this update will remind riders that mutual respect is an important part of our Community Guidelines. These updates are part of our continued effort to ensure everyone has a 5-star ride because Uber is better for all when both drivers and riders do their part.